Huge thanks to Dana for hosting today’s part of the blog tour! 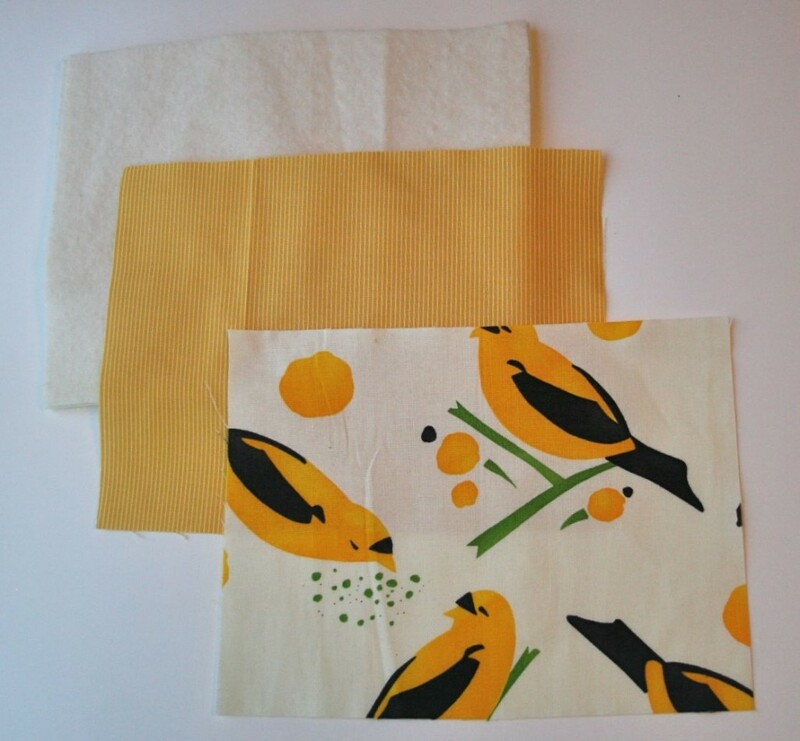 She put in a special request for a bias tape project, like the Picnic Placemat in Stitch by Stitch, and is just as crazy for yellow as I am. So here, for your quick-crafting pleasure, a simple tutorial for easy, fast, pretty pot holders–complete with loop! See the tutorial after the jump! Arrange the pieces with backing right side down, then batting on top of that, then main fabric right side up. The main fabric can be patchwork, and if you’re a quilter, you’ll recognize this as a quilt sandwich. If we were creating a quilt, this is where we’d do the quilting. 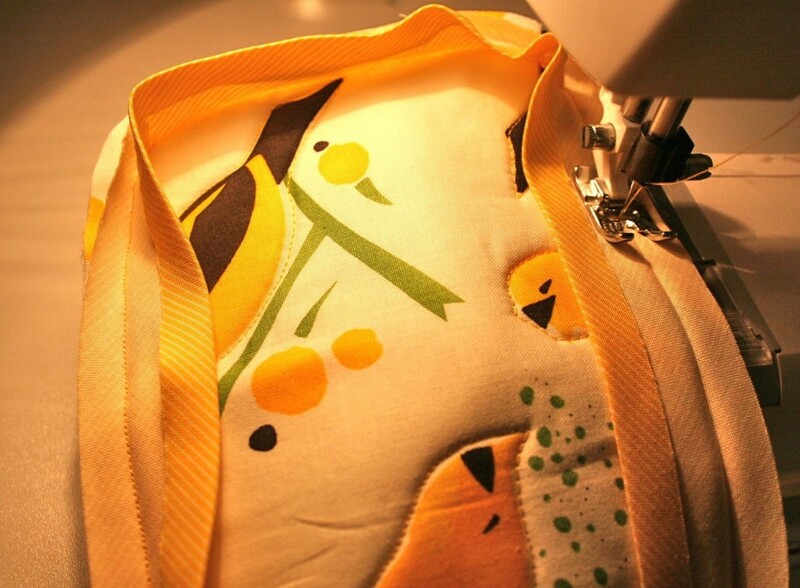 In this case, I machine stitched around the outline of one of the design elements in the fabric. I used a slightly longer stitch length to give the it a little more visual presence, and went through all the layers. 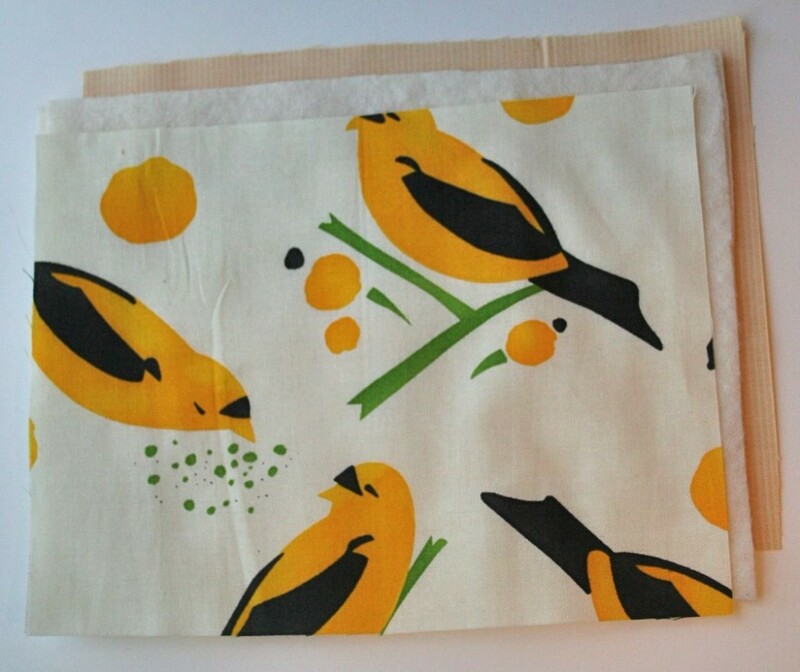 I really like the lightly quilted appearance it gives, and how it makes the birdies pop. So now I’m ready to bind the edges and finish this bad boy! 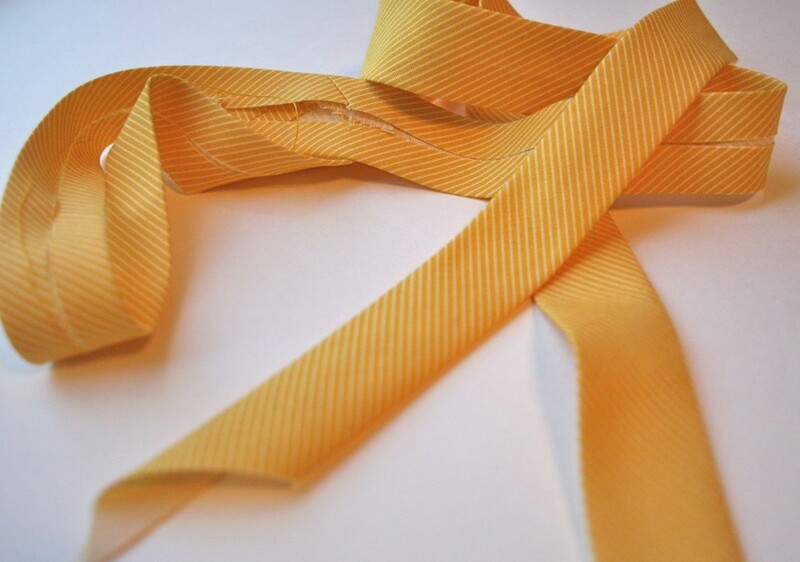 Single fold bias tape, made from a delicious micro-striped cotton print in the perfect shade: Whipstitch yellow. I used my Clover bias tape maker to press this up. Bias strips are cut 1 and 7/8″ wide, then pressed using a 25mm tip. As a bit of an afterthought, I rounded the corners of the pot holder–I eyeballed this step, so it’s not terribly exact, but I like the softness of it better for this project. Begin with the bias tape on the upper edge, with the end of the tape in the spot where you’d like the hanging loop to go. Place bias tape to the front of the pot holder, with raw edges even and right sides together. 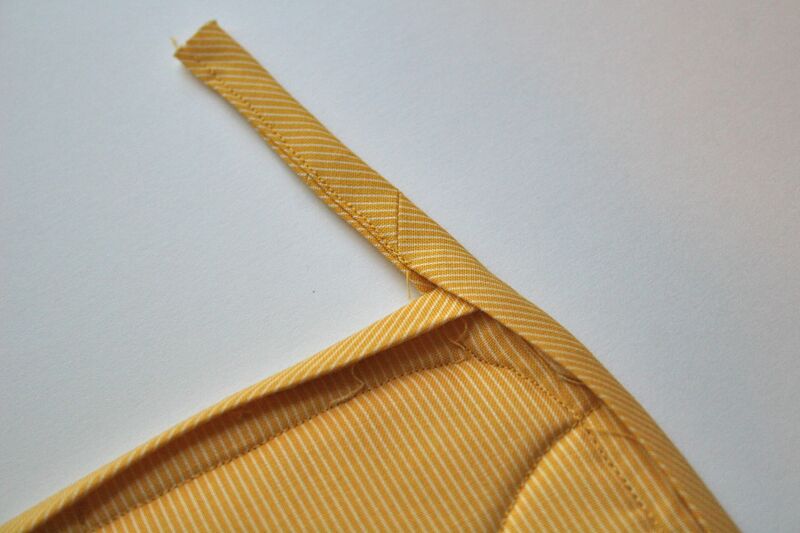 One folded edge should be opened out in order to get those edges lined up evenly. 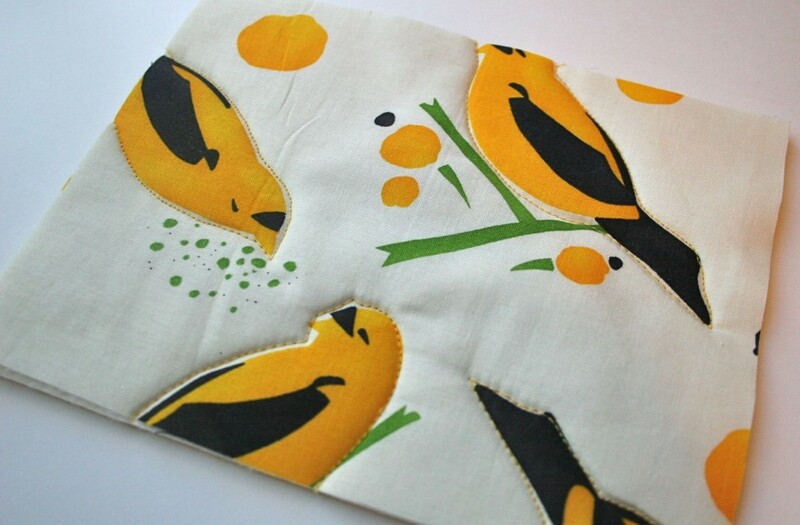 Leave the first 1/2″ UNstitched, and begin sewing the bias tape down. 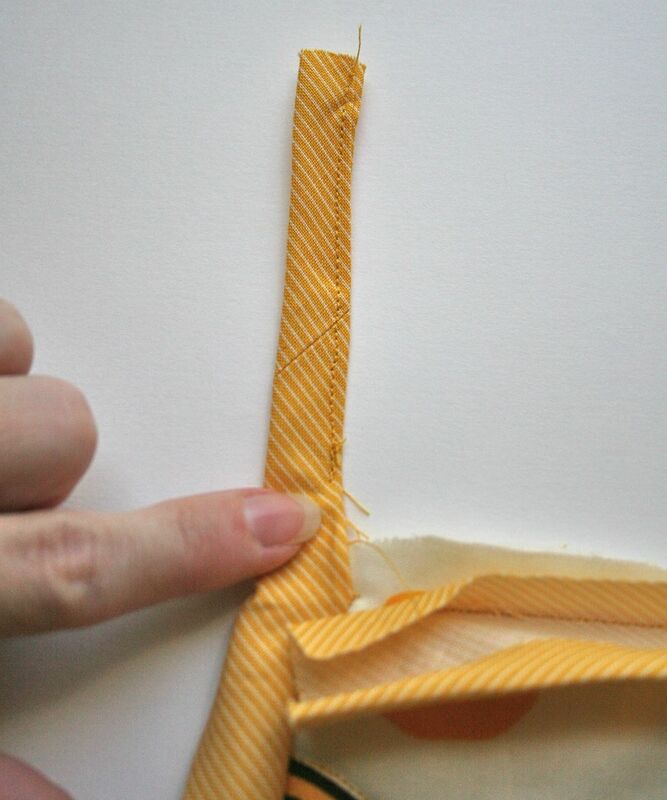 Stitch the bias tape through all thicknesses using the fold as your stitch guide. When you get to each rounded corner, you’re gonna flip: the stretchiness of bias tape makes it possible to simply curve around and mimic the shape at the curve. Very cool. 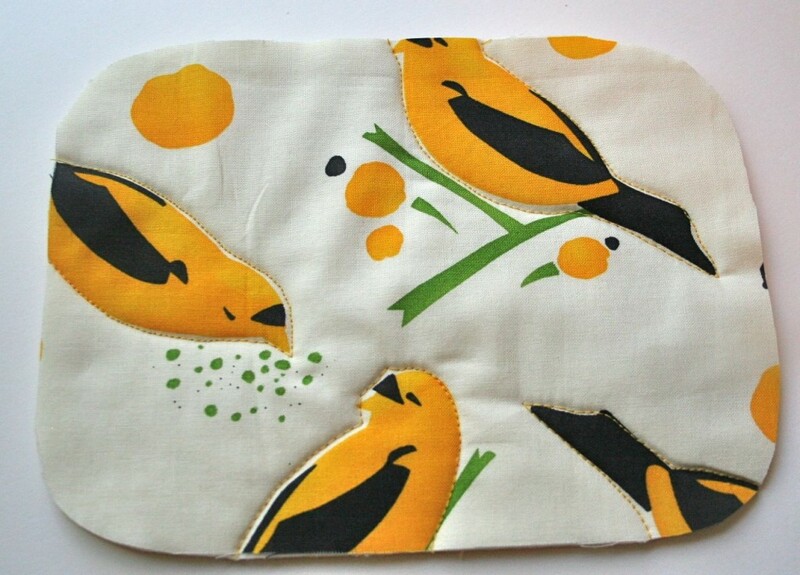 About halfway through, your pot holder looks more or less like this. Keep going, but don’t get too excited–you’ll want to stop before you get back to where you began. When you get back to your starting point, fold back the little bit of bias tape you left unstitched (the edge nearest you in the image above). Stitch the other end all the way up to the first set of stitches, but STOP before the needle goes through the first end of the bias tape. Take your work off the machine. 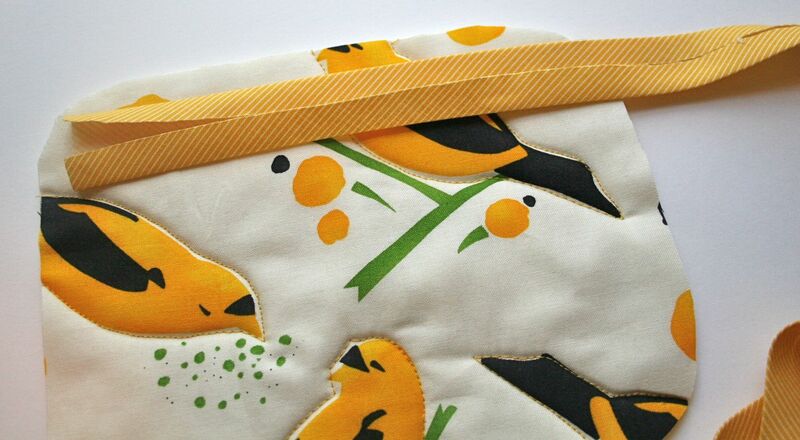 At the end of the bias tape, where you’ve just left off stitching (not at the beginning), pull the tape away from the project a bit and fold it in half. 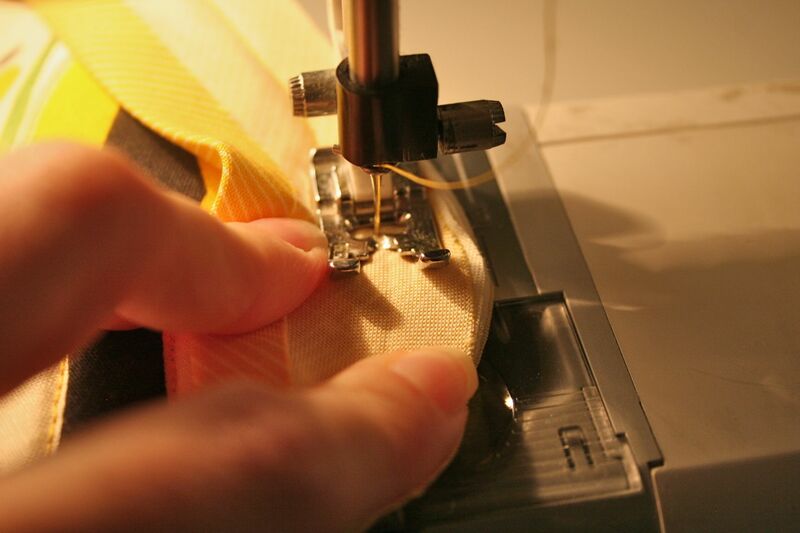 Beginning about a finger-width away from the body of the project, stitch the folded sides of the bias tape to one another to create the tab that will become the loop later. 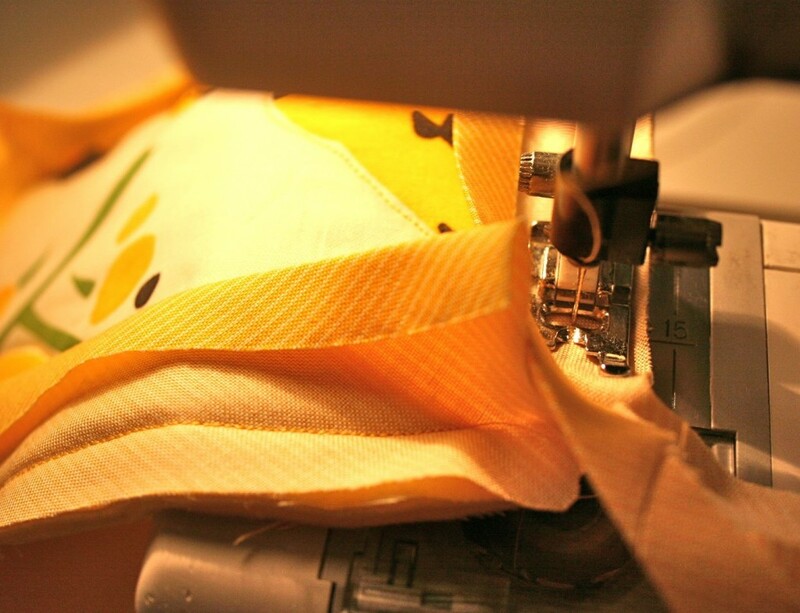 Be sure to backtack at each end of your stitching. 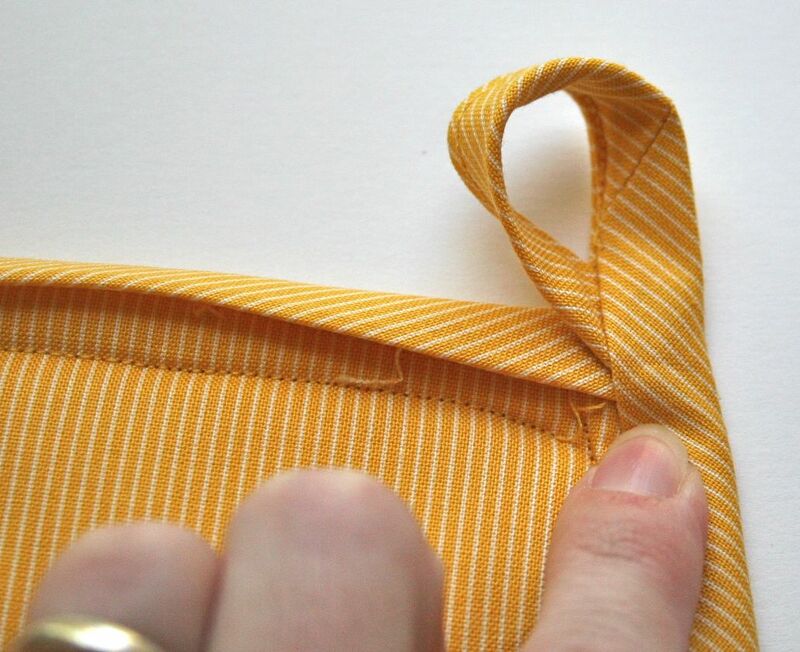 Once you’ve stitched the two bits of bias tape together in order to make the tab, fold all the bias tape around to the back of the pot holder–you might have to trim some seam allowances to do this, especially a the corners. With the bias tape folded to the back, tuck the unfinished end of the bias tape INSIDE the gap you left when you stitched the tab. See how the beginning of the bias tape now fits inside the end, just below the tab? Trim all your stray threads here, before the next few steps. With the raw end of the bias tape still tucked inside the gap below the tab, fold the tab back in on itself in order to form a loop. Pin in place, if you like. To finish, either machine stitch around all the edges, catching the loop securely as you do, or whipstitch the binding on the back as you would a quilt. I’ve topstitched the bird pot holder, but I could’ve stitched in the ditch, like I do with the Picnic Placemat in Stitch by Stitch. 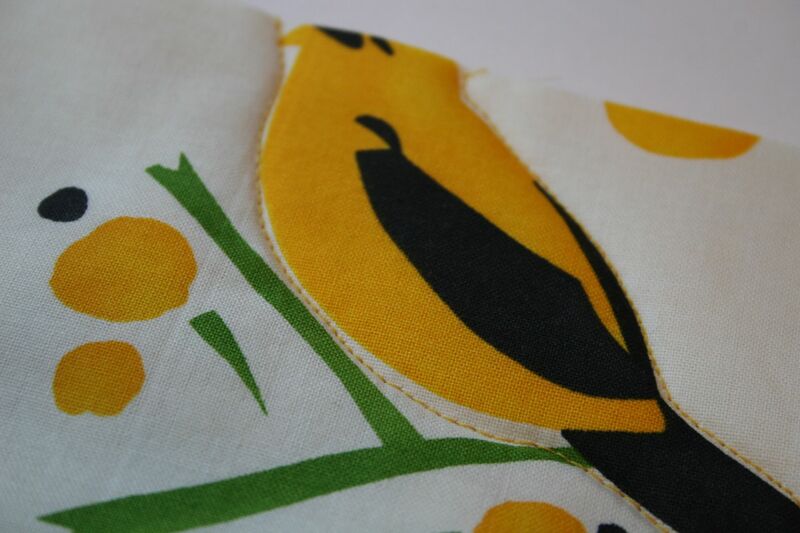 On the banana, I hand finished the binding and added some hand embroidered detailing. For realism. And there you have it! Your delicate hands are now protected from all manner of heat and spills. And your kitchen is that much brighter! Updated to include a PDF pattern piece for the banana shape! Enjoy! ← Fabric Design Weekend Was So. Much. Fun. How cute! I love both of those and can’t wait to try making my own! Thanks for the great tutorial! Oh, I’m so glad! 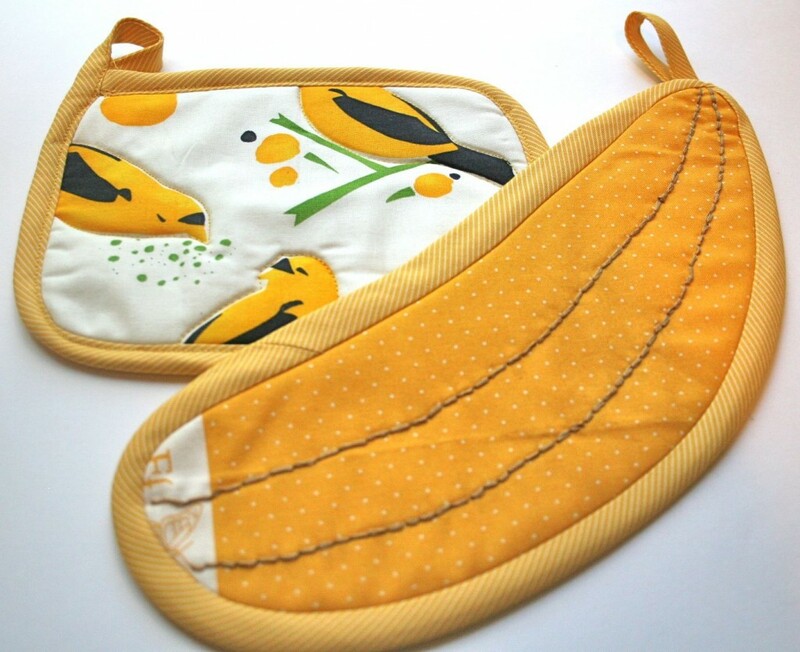 I love the banana, especially–am putting up a PDF pattern for the banana shape later today, so stay tuned! Wow! I’ve been wondering about the bias tape maker tools!! It looks like it makes the job much easier rather than actually cutting it out with scissors. This is going to have to be a “must have” to make great binding that looks as good as yours! Thanks, Becki! I actually use the Clover bias tape maker but not the Simplicity bais tape machine–the latter has a heat source and a motor, but the Clover is just a handy gadget that I use with my iron. Cutting with the rotary cutter for small amounts of bias tape helps keep it super pretty, or cutting with very sharp scissors. Hope that helps! Very nice job. I am in love with that banana pot holder! How creative. Great tutorial, I make potholders but never thought of shaped ones! Adorei o pegador de panelas em forma de banana. Lindo! Hi… Thanks for explaining how to sew the bias tape on. I could not figure out how to do the first stitching so it would fold over nicely. Now I know. Very cute potholders. I always wondered about ending the bias edge where there was a loop involved. You have made it look simple. I’ll give it a try! 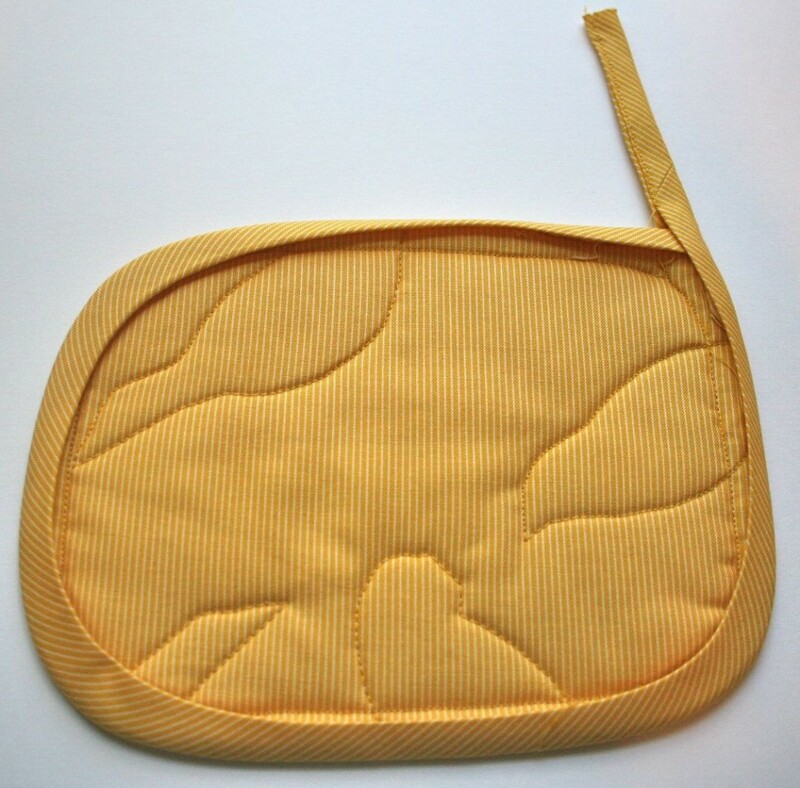 I’m assuming most people reading your webpage will know this, but you might want to mention that using some types of synthetic batting in potholders (at least ones that really get used with hot pots!) can be potentially dangerous. Hi from Norway, I am doing a handbag which hand some tight curves, I need to sew bias binding, and the binding is not stretchy, I wonder how to do a nice finish, thanks so much. Interested in taking the skirt class. Can these videos be watched on iphone5, iPad ? Yep, the videos can be watched on all your portable devices! I usually recommend laptop or iPad for size, so you can really view the details of each step. Will hope to see you in class! Świetnie sobie poradziłaś bez lamownika a lamówka przyszyta super. Thanks so much for the tutorial, ESPECIALLY constructing that loop! I have wrestled with attaching loops (and uttered many an un-ladylike word along the way) into the bias binding for a looooong time. Yay for coming across your tutorial!